After finishing a successful server migration from SBS 2003 to multiple Windows Server 2008 R2 servers there were some DNS issues. After a restart of the domain controller it looked like DNS is not working as it should the servers are also signaling they don’t have an internet connection. Restarting the DNS service fixes all problems for that time, but after a new restart same problem comes back every time. 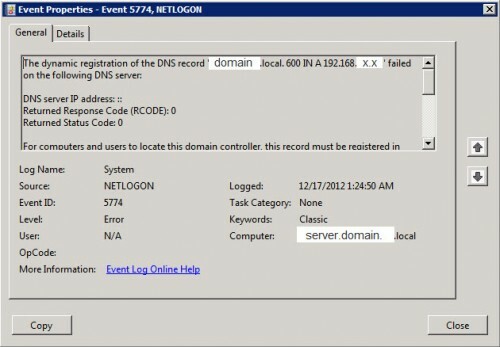 For computers and users to locate this domain controller, this record must be registered in DNS. Determine what might have caused this failure, resolve the problem, and initiate registration of the DNS records by the domain controller. To determine what might have caused this failure, run DCDiag.exe. To learn more about DCDiag.exe, see Help and Support Center. To initiate registration of the DNS records by this domain controller, run ‘nltest.exe /dsregdns’ from the command prompt on the domain controller or restart Net Logon service. Or, you can manually add this record to DNS, but it is not recommended. Error Value: DNS name does not exist. Dynamic registration or deletion of one or more DNS records associated with DNS domain ‘domain.local.’ failed. These records are used by other computers to locate this server as a domain controller (if the specified domain is an Active Directory domain) or as an LDAP server (if the specified domain is an application partition). 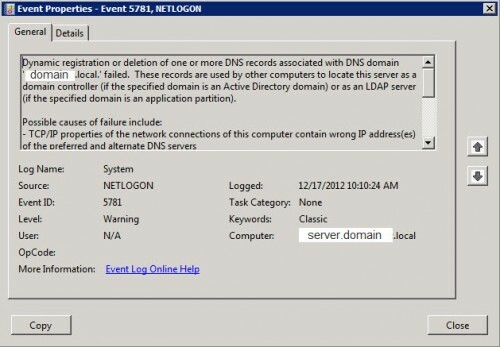 Fix possible misconfiguration(s) specified above and initiate registration or deletion of the DNS records by running ‘nltest.exe /dsregdns’ from the command prompt on the domain controller or by restarting Net Logon service on the domain controller. Error: DNS server: OLDSERVERNAME. domain.local. As you can see the test is trying to resolve the old servername at the Delegations test. At the end the problem was when looking in DNS manager and going to the domain.local – _msdcs subzone, the NS record had still the old servername entered. Just change the record and change the data to the new server information. This resolved the first error, but the second stayed. This error occures because there are one or more DNS zones are not correctly saved within Active Directory. You can easy see this by using the Registry editor regedit.exe and browse to HKEY_LOCAL_MACHINE \ SOFTWARE \ Microsoft \ Windows NT \ CurrentVersion \ DNS Server \ Zones. All you dns zones should be located over here. As you can see there isn’t a REG_SZ value DirectoryPartition DomainDnsZones.domain.local or ForestDnsZones.domain.local these are the problem zones. I had to delete these zones (both were manual made zones in the past on the old DC) and recreate them. After recreation the REG_SZ value DirectoryPartition value was set and the event warnings didn’t come back as after restarts no problems have raised anymore. Posted in Blog, Windows 2008R2 at January 7th, 2013. 7 Comments.